Frances Smith is a pseudonym for a woman who lived in fear of her life for 22 years. This is her story. 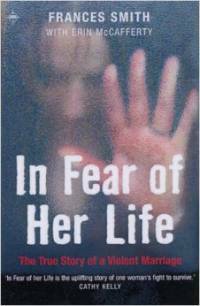 In Fear of Her Life is a true account of domestic violence. It narrates in the first person, how a relationship can turn so sour. Married at 16 to a criminal, she endured years of relentless mental and physical torture until she found the strength to fight back. This courageous story is told with brutal honesty and, at times, humour. It chronicles her descent to the brink of suicide and consequent rebuilding of her life. This unique account is essential reading for all those who have ever endured cruelty at the hands of a man, or another human being for that matter.